This technique is a much sought after and sometimes difficult to do if you are not aware of some of the little tidbits you need to know. Here I am going to show you a stress free transfer you can use in your ATC's, journals even greeting cards. Supplies needed: paintbrush, water container, gel medium (I have read you can use Elmer's glue or ModgePodge) I am using gel medium because I know it works for me, inkjet images from your computer, either B&W or colour, receiving paper(paper image is being transferred to) and a piece of paper towel and heat gun. 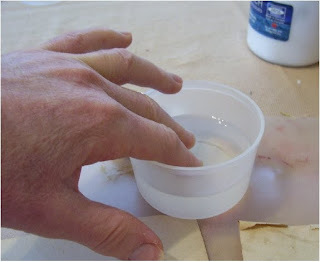 Apply a generous amount of gel on your receiving paper. 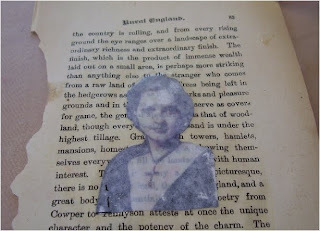 Here I am using an old book page and putting my image in the center because I will later be cutting it to fit onto an ATC. 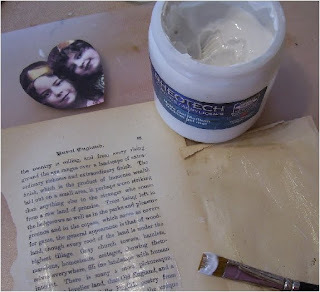 Next, place your image on top of the gel and make sure you have it positioned where you want it before burninshing (rubbing) it onto the paper. Make sure it is well burnished, making sure the sides are pressed down as well. If they are lifted a bit, apply some gel. Do NOT put gel over the back . 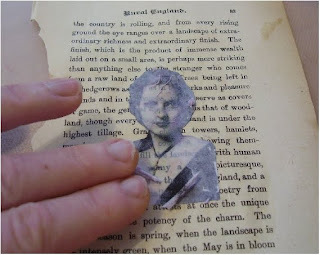 Using your heat gun and keeping it moving so you don't burn the paper, move it over the image and dry the gel and the what is now the back of the image. Turn the paper over and continue drying that paper. It is very important to make sure that your image is completely dry before moving onto the next step. If you do not have a heat gun you could use a hair dryer or let it air dry and do something else. 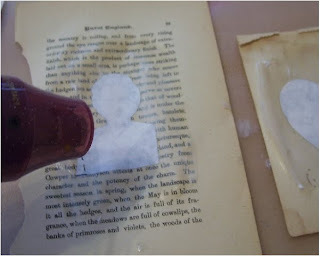 now spread the water over the image making sure you have the paper damp. 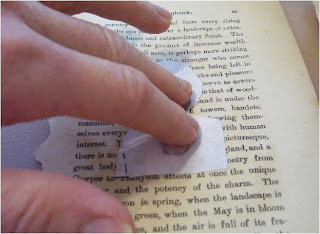 Don't be worried if you get the paper around the image wet, but do NOT saturate the papers. As you can see here, the image is now visible but we still need to remove that layer of paper. Starting at the middle of the image, start rolling your fingers over the image moving from center out and you will start to feel the paper coming off of the image. 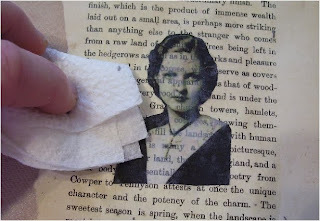 If you have the paper too wet or rub too hard you will start to damage your transfer so be gentle. Here you can start to see your image and I let the bits of paper that I rolled off so you know what it is starting to look like. If you feel the paper, keep gently rolling it off. As mentioned before it is best to start from the center, if you had started at the edges then you are apt to start to peel away the picture and you will become frustrated and not too happy. Been there done that. 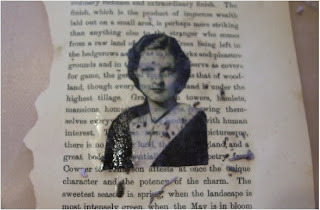 Now take your paper towel and gentle smooth off the rolled paper bits and you now have just completed your first inkjet image transfer. 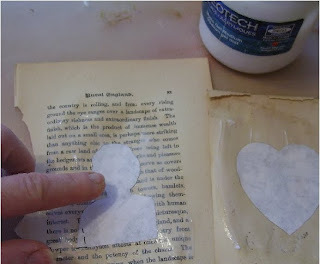 Allow the paper to dry completely or hit it with the heat gun then proceed with your arwork. 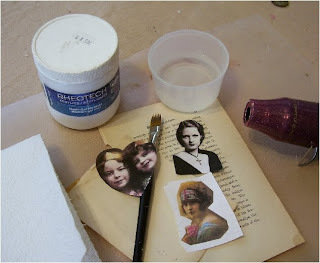 I hope you have enjoyed this tutorial and hopefully this post will land on my blog. The previous attempt landed somewhere but not here. If you care to leave a comment I would be glad to hear from you. Now off you go and lets see some image transfers. great tutorial...easiest one i've ever seen...ahh if i only had a printer!! lol. most of my images i get printed at office depot (laser). Once i get a new cartridge, i'll sure be trying this! been there as well, but good tut, will make some atc's. Thanks. I will pass this on though. Great job on this tut! Can't wait to try it. I have always been interested in this, but have not yet been successful. Thanks for that! so many different ways to get to B from A..not seen this way ..been visiting you for a couple of weeks LEARNT so much and youve got me in That frame of mind again! WoW...Lesley....thats neat...you make it look easy but I'm sute its not and takes practice but I'm up for the challenge!!!!!! Hope all is well with you girlfriend! Thanks for the tut..as always very well done.. different slant on doing it.. maybe this one will work for me..lol you've seen my other attempts..
....thanks for the tutorial...it really helped! fingers crossed - have had limited success with this method but after reading your tut think i am being far too heavy handed. You have def persuaded me to have (yet) another go.